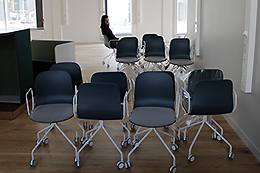 LiU’s work to create the teaching methods and facilities of the future starts in Vallastaden. Teaching staff from LiU will have the opportunity to discover what it’s like to teach in what is known as an “Active Learning Classroom”, or ALC. When the housing and social planning exhibition Vallastaden 2017 opens on 4 September, one of the attractions will be an Active Learning Classroom, or ALC, with space for 27 people. It is located next to the innovative offices at St Kors. Teachers active at LiU have been given the opportunity to express an interest in holding classes in the ALC. And several of them have done so. “We have at least one lesson in the ALC every day,” says Frida Ekman of the Facilities Management Office, and coordinator for the ALC during the exhibition. Examples of teaching that will be held here are lessons in urban and regional planning, in culture, society and media production, and in the history of art. Other users include the library and LiU’s unit for innovative teaching, Didacticum. The ALC in Vallastaden is not a packaged solution with instructions for use. Quite the contrary, actually: the idea is that the classroom acts as a catalyst, where the preconditions have been laid for teachers to discover what is possible here. And – as the name suggests – an ALC creates the conditions required for students to become more active in the learning process. The teacher provides guidance, while students are arranged in groups and contribute by processing the information and viewing it from different angles. “This is negotiated knowledge rather than delivered knowledge,” says Konstantin Economou, head of LiU’s participation in Vallastaden. He can give examples of how an ALC helps him in the courses he holds in social media. In this context the technology is secondary: the important aspects of the concept are its flexibility and the way it creates encounters. And the ALC provides more than simply a way of enabling work in groups. If this was the only benefit, it could have been achieved by building more group rooms. “It is also important to emphasise that the ALC is not suitable for all teaching. It is to be used for the components and courses for which it is suitable,” says Frida Ekman. This became evident during a study visit to the University of Minnesota that Frida Ekman undertook. During the past 10 years, the university has restructured one third of its rooms to ALCs, and mixes conventional lectures with teaching in these. 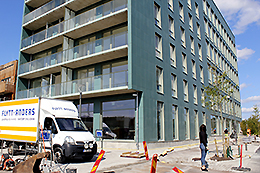 The Properties Division is planning to build on the experience gained from the test facility in Vallastaden, and in collaboration with, among others, the teaching staff at LiU start the work to create the teaching facilities, teaching methods, and digital development of the future. The first step of this has already been planned – to restructure one of the teaching rooms in the C Building as an ALC. Are you interested in testing the ALC in Vallastaden? Use this link to make an enquiry.